21. Spray on skin to relieve dry itching skin. Helps skin retain its elasticity. 22. Wash hair with shampoo and conditioner like always and after it dries....Use about the size of a dime of SSS and rub it in your hair. It goes straight in and leaves hair as shiny as the ads on TV, not greasy at all, just soft and shiny. 24. Sometimes, using bath oil, like Avon's Skin So Soft, will work to loosen the glue which holds the nits to the hair. There is a product called Neon Nits, which when sprayed on the hair, will highlight the nits so you can see them to then snip them out with a small scissors. 25. Psoriasis on elbows. 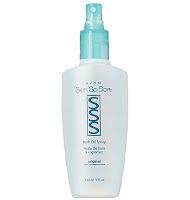 Try Avon's Skin-So-Soft bath oil spray on affected areas. 35. It takes fur off off clothing. 39. Use it to discourage hornets from building their nests. After using a hornet killing spray, remove the nest and keep the area sprayed with SSS. They will not rebuild there. 40. Use it to clean leather, it will also keep it soft and supple. New Follower from Thursday's hop! Stopping by from New Friend Friday. I had no idea Skin So Soft had so many uses. I had no idea you could do so many things with Skin So Soft. Thanks for sharing. I'm a new follower from Thursdays Friends and Giveaways. I'd love a follow back! Love SSS! I haven't used it in years but use to! I am your newest follower...thanks for joining us today for TFAG! Love that you came by. Enjoy your day! Hi, I'm a new follower from This for That on Ten Talents! Would be great if you could follow me too. new follower from this for that.